Just 5 kilometres from the centre of Port Douglas and 450 metres from beautiful Four Mile Beach, Paradise Links Resort Port Douglas is located in beautiful surrounds adjacent to the Palmer Sea Reef Golf Course. This Port Douglas accommodation is the ideal setting for a golfing getaway, family holiday, or romantic escape. Paradise Links Resort Port Douglas, is made up of elegantly appointed hotel rooms and apartments that overlook the lagoon style swimming pool and tropical gardens to self contained villas overlooking the fairways. There's plenty to do without even leaving the resort, with one of Australia's best championship golf courses, the Palmer Sea Reef Restaurant, two swimming pools, a tennis court and BBQ facilities all onsite. From Paradise Links Resort Port Douglas you have easy access to snorkelling the Great Barrier Reef, Daintree Rainforest excursions, or spend the day shopping and relaxing at the many boutiques, restaurants and cafes on Macrossan Street. 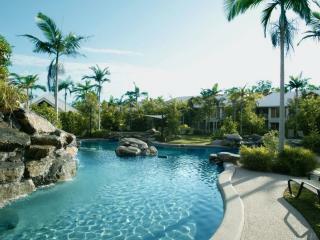 For a truly memorable North Queensland holiday, look no further than Paradise Links Resort Port Douglas. 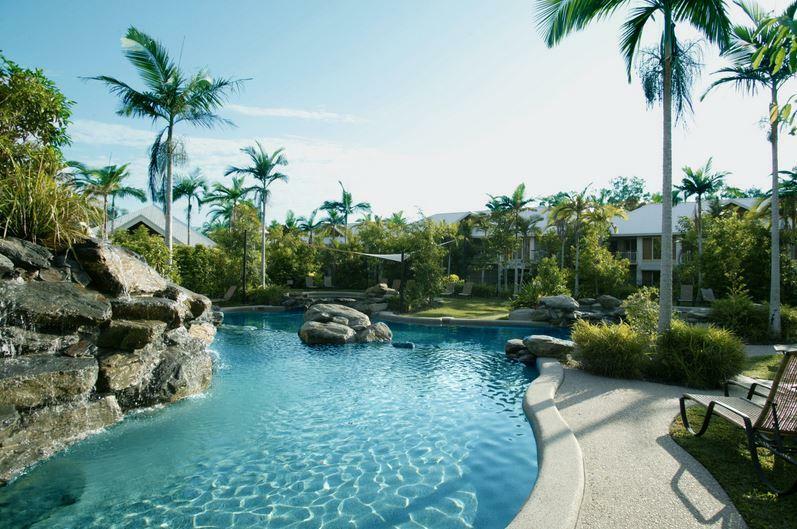 Paradise Links Resort Port Douglas offers a range of accommodation from hotel rooms and apartments surrounded by tropical gardens to fully self contained villas overlooking the golf course. Links Hotel Room: Overlooks the tropical gardens and swimming pool. Bedding is 1 King Bed OR 2 Single Beds. 1 Bedroom Apartment: Overlooks the tropical gardens and swimming pool. Features a kitchenette and laundry facilities. Bedding is 1 Queen Bed. 2 Bedroom Villa: This 2 storey villa features a full kitchen, laundry facilities, two bathrooms and an additional powder room downstairs. Offers views of the green fairways and tropical gardens. Bedding is 1 King Bed + 2 Single Beds. 3 Bedroom Villa: Set over two levels overlooking the Links Golf Course, fully equipped kitchen with European appliances, separate lounge and dining area, ensuite bathroom with spa bath, second bathroom, downstairs powder room and laundry facilities. Bedding is 1 King Bed + 1 Queen Bed + 2 Single Beds. 4 Bedroom Villa: This extensive villa has all the space needed for a family or group of friends travelling together. Featuring stunning views of the green fairways and lush tropical gardens, this 2 storey villa offers 3 bathrooms plus a powder room, laundry facilities, full kitchen and large dining and living area. Bedding is 1 King Bed + 2 Queen Beds + 2 Single Beds. Villa Paradise: This amazing 2 storey villa is pure luxury, subtly decorated with Asian influences. With views over the forth tee and tropical gardens, you can relax by your own private swimming pool. Features a full kitchen, spacious lounge and dining area and laundry facilities. The master bedroom with ensuite is located downstairs, with a second master bedroom and ensuite with spa bath is located upstairs. There are two additional separate bedrooms an another bathroom. Bedding is 2 King Beds + 1 Queen Bed + 2 Single Beds. Port Douglas abounds with fabulous restaurants and sidewalk cafes, serving a variety of cuisines from around the world. No matter your preference, vegetarian to Italian you are sure to find plenty of restaurants that suit your tastes.